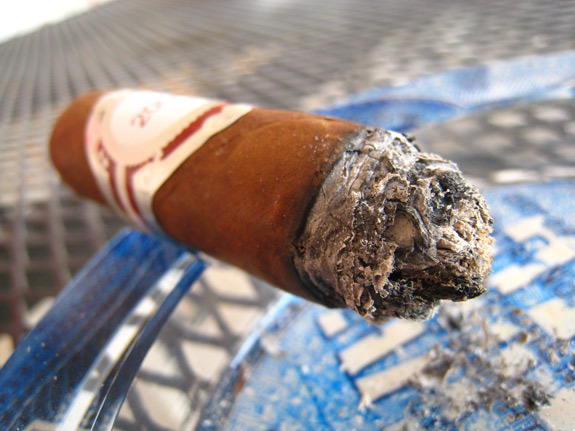 It’s been a while since I have posted a cigar review on the site, and with good reason. The last two weeks have been some of the craziest in my life. Too busy, and each time I do find a few minutes to smoke, I end up grabbing something small for fear of not being able to finish. Fortunately, things seem to be winding down a bit, and I am here today to bring you a review of Tatuaje’s L’eperit de Verite (pre-release). As stated before, this is a pre-release stick. 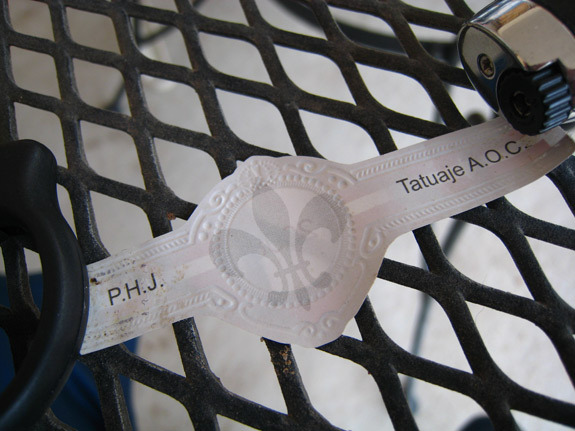 I got my hands on a few via various packages from Pete Johnson, creator of Tatuaje Cigars. “The idea behind this highly anticipated release borrows heavily from the wine industry. All of the tobacco, habano criollo, will be from the one farm in Esteli-making this a Nicaraguan puro—and each year will produce a different “vintage” to mirror the vintage concept in wines. 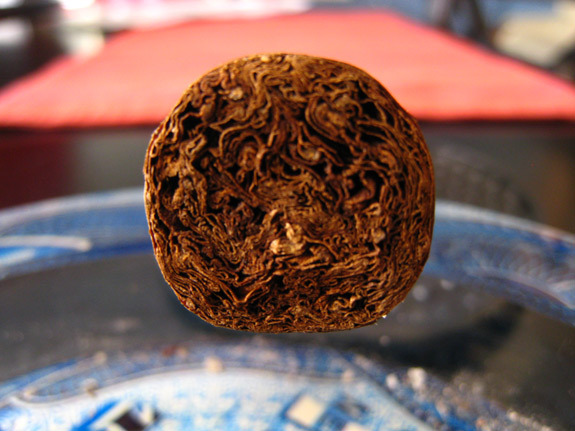 The tobacco will be fermented but, unlike most cigars, it will be rolled without undergoing further aging in bales. Usually I try not to “borrow” information from other review sites, nor ever look at similar reviews until mine is posted, but I didn’t want to leave you guys hanging and the Stogie Guys seemed to have the good. If you haven’t checked thier reviews out I suggest you do so. Probably the most information heavy reviews I have seen out there. Prelight:The band on the L’esprit de Verite is unlike most bands bring produced by Tatuaje. 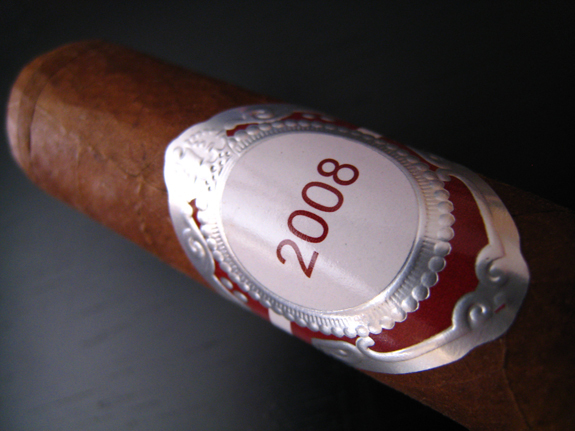 It’s a crisp maroon band, much larger than the average Tatuaje band. The band has a nicely tucked embossed silver crest surrounding it, accompanied by the familiar Fleur De Lis Tatuaje is known for. The band also boasts very largely the year “2008”. Im not too sure if this is what the finalized band is going to look like but it’s pretty different, as well as interesting. The wrapper on the L’esprit de Verite is a very light complected chocolate brown. 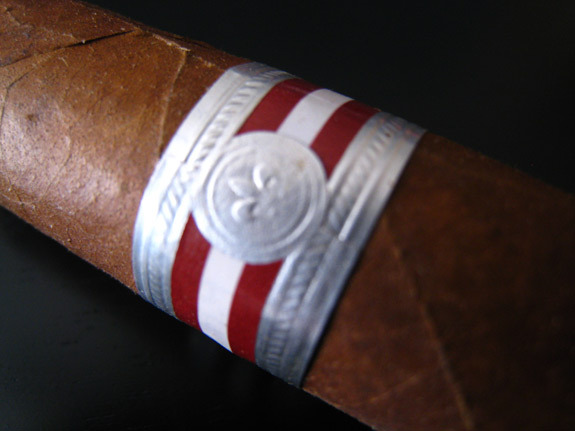 The wrapper is incredibly consistent in color with the exception of a small lighter brown portion of the cap. The L’esprit de Verite is a very well crafted cigar sporting no soft spots and just a few tiny veins. 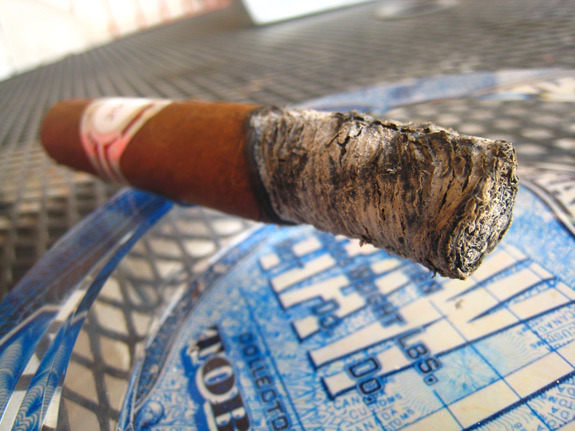 The wrapper on the body of the cigar smells very sweet and oaty, where as the foot gives off a very grassy scent mixed with honey and molasses. First Smoke:The L’esprit de Verite lit up with no problems at all. The first initial flavors were that of spice and pepper. 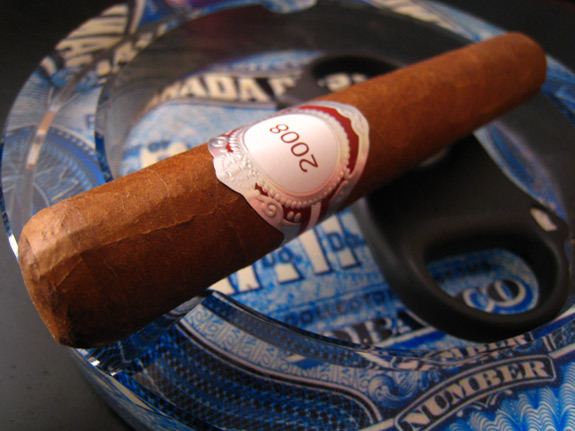 This was yet another cigar that hit me in the face with the quick and strong pepper flavor, then diminished. The flavors then leveled off and very grassy, bran, natural tobacco taste. 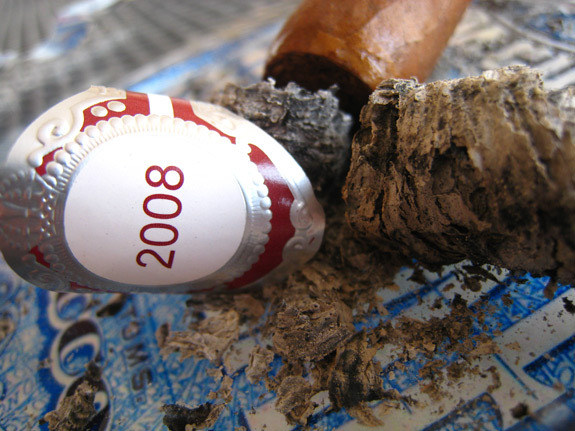 The draw was effortless, and the smoke was thick and flavorful. The L’esprit de Verite gives off a ton of stationary smoke. I went in the sniff the smoke and was hit with strong pepper. Be careful retro-haling this cigar. The burnline was dead even and razor sharp. The ash left behind was incredible. It left a trail of bright white with no signs of flowering or flaking. Halfway There:At the halfway point I encountered a very big change up in taste. The pepper and spice were no longer present and the main flavor was of a smooth, creamy, sweet tobacco. I didn’t expect a cigar with this wrapper to produce as much flavor as this cigar did. The burnline create a slight wave, but nothing that I am too concerned about. 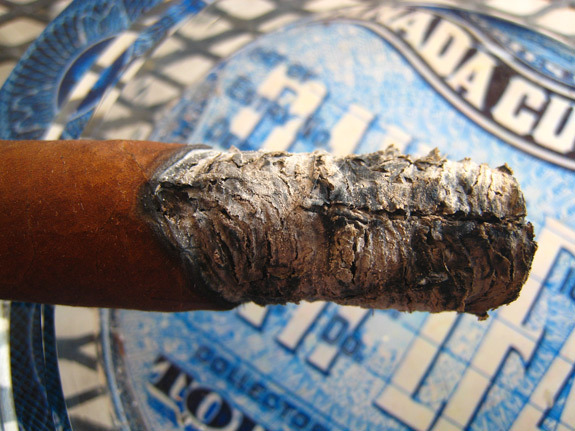 The ash still held its ground well into the second half and finally gave way almost 2 inches into the cigar. 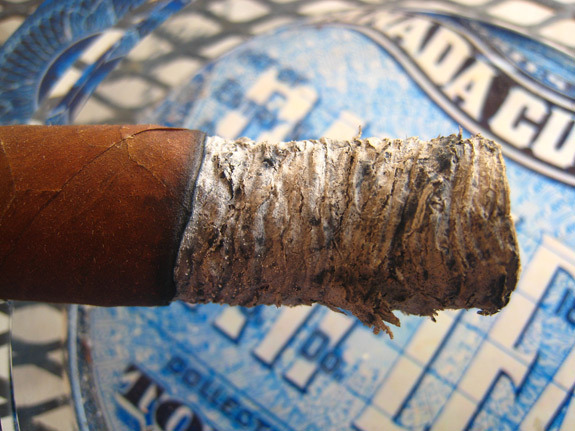 On interesting note, the top half of the cigar’s ash produced an area that was a very dark grey. I’ve seen this often in criollo wrappers due to the oils, but never as spotty as this. An interesting note on that area though is it had a strange gash through the center of it. The wrapper didn’t portray any type of vein in that particular area, and once I passed it that “gash” is when I noticed the great flavor change up. the following are pictures I took of both sides of the ash. Just to give you an idea. Finish:Judging by the kick this cigar gave me when I first started it up, I would have had no idea it would have finished so creamy and smooth. The pepper and spice never really came back, but the sweet natural tobacco taste you can expect from Tatuaje cigars only increased towards the end of this smoke. The main flavors outside of tobacco were honey, creamy chocolate, and oats. I felt a slight nicotine kick from this one, but nothing to worry about. It’s definitely @knightrid safe. All in all it took about and hour and a half to smoke down this robusto sized cigar. Overview:I can’t really form a solid conclusion on this cigar due to it still being in pre-release form. But what I can tell you is that if this sample is any indicator of how amazing the final product will be, then Pete has produced yet another winner. The L’esprit de Verite is a well rounded, extremely well constructed cigar that would not only appeal to the avid cigar smoker, but even a new comer as well. Sounds like that cigar had a really unique flavor profile. Hard to find one that can give two very distinct dimensions that are both enjoyable. Those are usually keepers for me! Can’t wait for Pete to release them! Another great review Tony; great pics, description, and, of course, great job scoring a pre-release. Thanks for borrowing from the SG to give us a bit of information on the stick. Thanksya Daniel, again, I’m not sure how the finished product will pan out, but I am def. interested to find out. Correct me if I am wrong, but the “futures” idea is not going to be implemented. I think these are just going to be released like a regular cigar release now. Nice review, sounds like an interesting smoke. I will probably try to get one of these whenever I get the chance.